Working weekend overnights. It’s great because I’m off by 9:00 and I’ve now got the whole weekend to do what I want. It’s bad because I’m exhausted. When I got home this morning, I was a little surprised to find J still in bed. She’s usually up by the time I got home and I had figured we’d go to breakfast. Not wanting to wake her, I crawled in bed, but waking her is exactly what I did. As we laid there talking, she heard my stomach growling and asked if I wanted to go to breakfast. I did, so we got up and went. Julianna’s Restaurant is a place we’ve known about almost since we moved to Kalamazoo a year and a half ago. We didn’t go right away because it was definitely a “wait until the smoking ban” place. 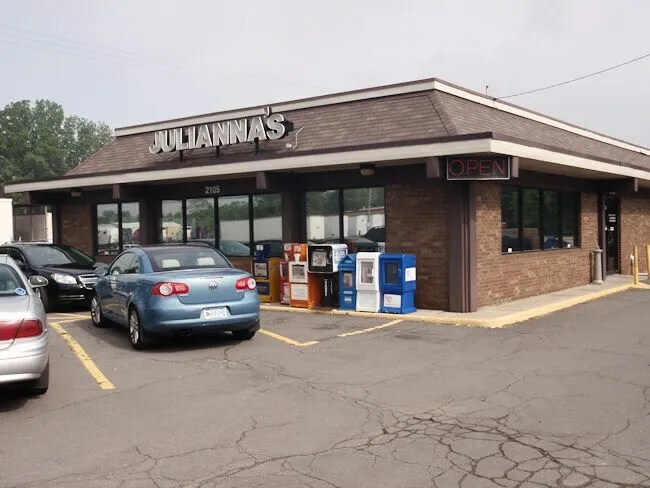 Ok, so I know the smoking ban has been in place for a while, but Julianna’s isn’t really near anything or even on a road we travel often so I would be reminded about it. The restaurant is on Lake Street right at the intersection with Business Loop 94. When you pull in to the parking lot, you expect a greasy spoon diner and that’s exactly what you get Julianna’s. Just before the smoking ban went in, Julianna’s gutted the interior and put in new furniture to get rid of the smoking smell. The funny thing about that is they didn’t really update the decade the furniture was from. The dining room is a large space that is divided with booths along one wall and tables in the rest of the space. There’s a sign written on the door that says to seat yourself, so we did just that. I noticed a booth along the windows and that’s where we headed. The menus were already on the table underneath a coffee cup and silverware. A waitress followed us to the booth and took drink orders as we were sitting down. I got a Pepsi and J went with an orange juice. When our drinks came, we were both ready to order. 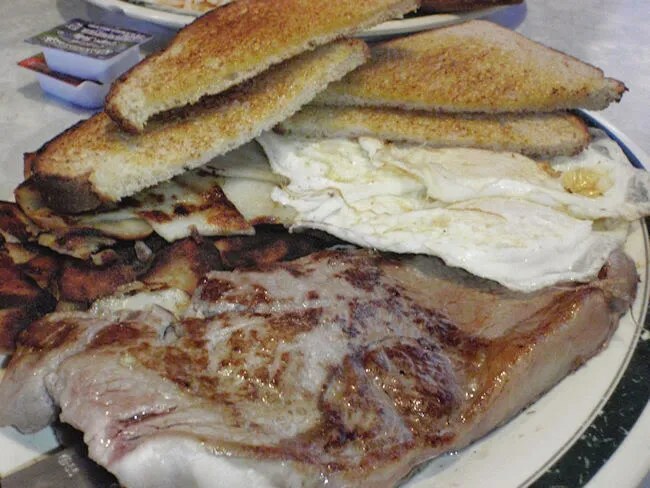 I went with breakfast #17 which is a steak, three eggs, home fries and toast. The steak was a small sizzler steak cooked on a greasy flattop with a little bit of a salty flavor. It was a perfectly tender medium rare steak that didn’t need the A-1 that was brought with my plate. The eggs I ordered were a little runnier than I wanted, but still very good. I just love the taste of steak grease and egg yolk. The home fries were not what I was expecting, but very delicious. They were very thinly sliced potatoes and fried on the flattop. There was a great crispy crunch on the top. I don’t always like breakfast potatoes, but these were really good. I cleaned my plate. 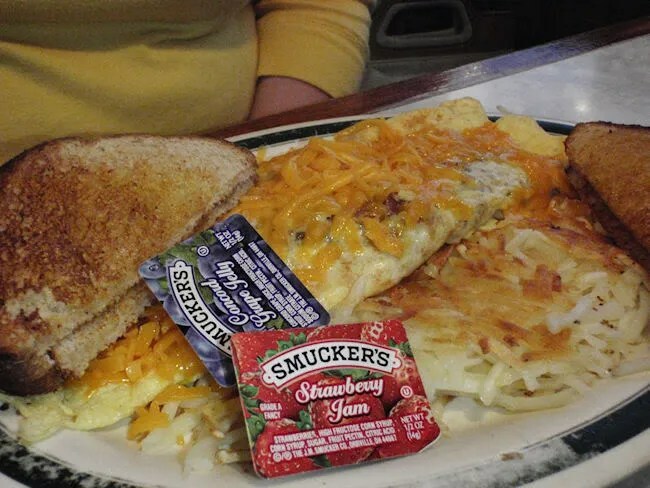 J ordered the bacon and cheese omelet which came with toast and hash browns. There was a lot of bacon. A lot of bacon. A whole hogs worth of bacon. J wanted some bacon in the omelet, but it was literally oozing with bacon. I would have been very happy with that, but it was a little too much for her. She opened it up and pulled a majority of the bacon off on to her plate and eventually on to mine. She ate about three quarters of the omelet and most of hash browns which had a nice golden top on them. Our bill was just over twenty bucks which is paid at a cash register up near the lunch counter which overlooks the kitchen. 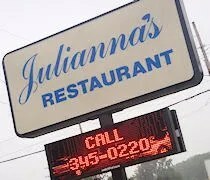 Julianna’s is another one of the great greasy spoons in Kalamazoo. There was a steady stream of people coming and going and tables were being turned quickly. The place was never 100% but it was pretty close. It’s a little out of the way out there on the business loop, but another place to keep in the mix when looking for a greasy spoon.